Learning to Love Thy Self…. I had a problem with weight my entire life. I remember being the target of many jokes and comments about how “chubby” I was. I remember hating when it was time for back to school shopping, because I had to wear the clothing to hide some of the fluffiness. As I grew into a teenager, the fluffiness turned into curves…which was a great change! I went from being the one the boys made fun of, to the one they wanted to date (too bad my parents wouldn’t allow me to date). Then I became aware of society’s view of what’s hot and what’s not. The curves that had raised my self-esteem had suddenly become fluffiness again in society’s eyes. So, it started all over again. Shopping was a disaster, because I couldn’t find the right jeans to to fit my hips, because society says that only smaller sizes and certain builds are right. Comments were made again in the workplace about how I was shaped. I fell into the trap of being a slave to other people’s opinions and what society says is beautiful and acceptable. It was so bad that I just stopped eating. I would go for days with probably under 300 calories and the scale became an obsession. I actually wanted to eat as little as I could just to see the numbers go down… it’s was a “how low can you go” contest everyday. 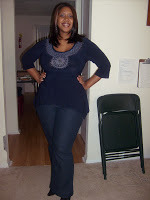 Before I new it, I weighed 114 pounds and I was a size 2 (which is not a healthy size for my build). (Now all of you blessed thin women…I am not saying anything negative about being a size 2…just wasn’t the size I was suppose to be). Yes, I had conquered my lifelong goal of being “skinny”, but I was not healthy. I was anemic, had no energy, and my complexion was very pale. In my journey of self discovery and learning to love myself, I renewed my relationship with God and it saved my life. I read Psalms 139 and it has changed my entire outlook on life. It talks about how God “knit me together” and that I am “fearfully and wonderfully made”. This was an epiphany to me…God made me and therefore there is no error in His creation. No, God did not shove all of the chocolate into my mouth, but he gave me every detail of my being (including hips). Not only did this Chapter reveal how God sees me, but it also made me realize that I must love and care for this body that he gave me. It has been a struggle, but I am now learning to not care about other peoples opinions about my “flaws”. I do believe that we should take criticism to help us to make improvements, because the day we totally stop caring about others and the way they see us…is the day we have become an arrogant individual. However, I am no longer a slave to those opinions. You don’t like my hips? So what, they’re mine, anyway. You don’t like my hair? So what, I bought my wig…you didn’t (he, he, he). You don’t think it is right that I stay at home with my kids? Isn’t my son just as intelligent and outgoing as any child that attends daycare and are you going to pay the daycare bill? I love every fiber of my being…not the shallow things, but the things that matter. I have even embraced my flaws, because that leaves me open to change them. After the birth of my 3 year old, I realized I had gained 60 pounds. I was really hoping that he would weigh 50 pounds, but he didn’t. I also started to “eat my troubles and stress away”. Which has added to the weight problem. So, 3 years and two babies later, here I am still with the weight. This time it’s different, though. Yes, I want the weight gone, but for myself…not just because other people say that I should lose weight. I am going to use this blog to hold myself accountable. My goal this time is to be healthy and let the weight issue take care of itself. So, I am trying to eat healthier, I have gone to some online “Over eaters Anonymous classes (to help with my emotional eating and fear of food), and started to exercise daily. My sister in law told me about some exercise classes held at our local recreational center and I even signed up to take a “Total Body Workout” class and haven’t missed one class. Most importantly, I have a husband who loves me unconditionally. He praises my new body, but is encouraging when I want to make changes to it. He has never made me feel unattractive, because I am not the size I was when we married. With all of this encouragement and support, I know that this time I am going to conquer this weight problem! So, the next time you see me and I am walking with a little twist in my step. No, it’s not because I am flaunting the shallow things in life. I am walking with my head held high, because of the many things that I have been through and conquered. It is only pride that is showing and not conceit. I am so proud of “Tracy”. The next time you see me…”Don’t hate, congratulate”. My husband and i have been now fulfilled when Jordan could round up his investigation from the ideas he received in your site. It is now and again perplexing just to be releasing things which usually the rest may have been making money from. Therefore we do know we now have you to thank for that. The type of explanations you’ve made, the straightforward website navigation, the friendships your site help to create – it’s most excellent, and it is facilitating our son and the family know that the theme is entertaining, and that is incredibly essential. Many thanks for all the pieces! I’m commenting to make you understand what a perfect encounter my child had studying your webblog. She picked up lots of pieces, with the inclusion of what it is like to possess a very effective coaching spirit to have other individuals very easily know just exactly specific extremely tough topics. You undoubtedly exceeded my expected results. Thanks for showing the warm and friendly, dependable, revealing and also cool thoughts on your topic to Emily. My wife and i were joyful when Albert managed to do his inquiry through the entire ideas he was given when using the site. It is now and again perplexing just to always be handing out guidance some other people might have been making money from. So we fully grasp we have the blog owner to give thanks to for that. These illustrations you made, the easy website navigation, the relationships you make it possible to create – it is many incredible, and it’s really assisting our son and us feel that the article is exciting, and that is extraordinarily fundamental. Many thanks for everything!